At the end of Rafik Schami’s sprawling The Dark Side of Love, recently released in English, the author worries about how Western colonialist narratives may have shaped and colored his work. The novel, which cost Schami 40 years and a library of more than 200 books, numerous magazines, and boxes of archival materials, was the work of a heart, he says, fixed in his native Damascus. However, the novel—which was written in his adopted German—resembles Western literature far more than contemporary Arab work. The Dark Side of Love spans a blood-feud-thwarted love affair and a murder-mystery, and is told in largely realist style. It lands its main character, Farid Mushtak, in Syria’s worst political prison. His beloved, Rana Shahin, is imprisoned in an asylum. Some wonderful things result from Schami’s mostly realist narration. Arabic literary narratives about political imprisonment tend to be first-person and absurdist or dreamlike—such as those of Sonallah Ibrahim (Egypt), Fadhil al-Azzawi (Iraq) and Sinaan Antoon (Iraq)—but Schami’s political prisons are precise, rich in visual detail, and apparently well-researched, as the author himself never spent time inside one. Al-Azzawi’s Cell Block 5, for instance, brings the reader deep into the emotional life of an Iraqi prison. But there are things we don’t see in Cell Block 5 that we do in Schami’s precise, sometimes watchmaker-like prose. This more distant narration—and the heft of an 850-page book—also allows Schami the space and time to lovingly develop his core characters, particularly Rana Shahin and Farid Mushtak, and Farid’s parents, Elias and Claire. While Aunt Jasmin may believe this, it’s something different for the book to found itself on this Orientalist-sounding rock. And the book’s opening fragments do come uncomfortably close to equating Arabia with eternal love and death. When Jasmin’s nephew shoots her to cleanse the Shahin family honor, a jet of her blood makes a sideways figure eight, the sign of infinity, on a wall. Fortunately, once the book moves into other stories—of Farid’s childhood and the ordinary, day-to-day lives of Damascenes—the mosaic loses its outline-ish quality. Schami’s book is, then, not a completely realist work. Throughout the novel, his core characters maintain a slightly larger-than-life status. They are flawed and believable and real, but they can also accomplish the impossible—as when Claire rescues her son from their country’s worse political prison. And they all, or the good guys at any rate, manage to live happily ever after. The Dark Side of Love is full-to-bursting with different varieties of passion: between the young and the old, those in first and second and third youths, married people and prostitutes. But the reader is always clear on the book’s two ultimate possibilities: Either our favorite lovers, Rana and Farid, will flee their homeland and make a life together, or they will fail. Farid makes a few hand-motions toward staking his life in Syria—he works as a teacher and edits a Communist magazine—and even tells Rana’s friend that he wants to create a world for lovers in Damascus. But the book never presents remaining in Syria, within Syrian logics, as a real possibility. The Syria of the book remains remote and unchangeable. The lovers’ job is to escape it. Some things do shift with the passing decades. Children get new toys, new technologies and ideologies appear from abroad, dictators come and go. But the new gadgets and ideologies don’t alter the characters’ lives, and bumbling, power-mad dictators repeat each other with little variation. It would be cruel to wish that Schami had stayed, and survived his years of military service. It would also take a hard heart not to cheer for the book’s underdog, fairy-tale lovers. Surely the book’s popularity with German readers is due in part to its wonderfully happy ending. But a strange aftertaste of the colonial experience remains. Perhaps this is one of the darker sides of love: It’s difficult to be completely happy about a “happily ever after” that lands our protagonists in post-imperial Europe, thus impoverishing Damascus and separating Rana and Farid from their histories and memories, changing them into people who speak a language their families don’t know. 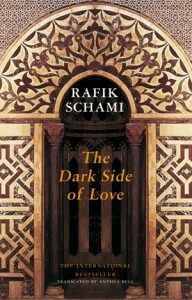 The Dark Side of Love by Rafik Schami, translated by Anthea Bell. Interlink Publishing: New York, 2009. American University in Cairo Press: Cairo, 2009. M. LYNX QUALEY earned her M.F.A. in creative writing at the University of Minnesota. Her work has appeared Black Warrior Review, Crab Orhard Review, Third Coast, The Quarterly Conversation, the New Orleans Review, and elsewhere. She lives and writes in Cairo, Egypt.